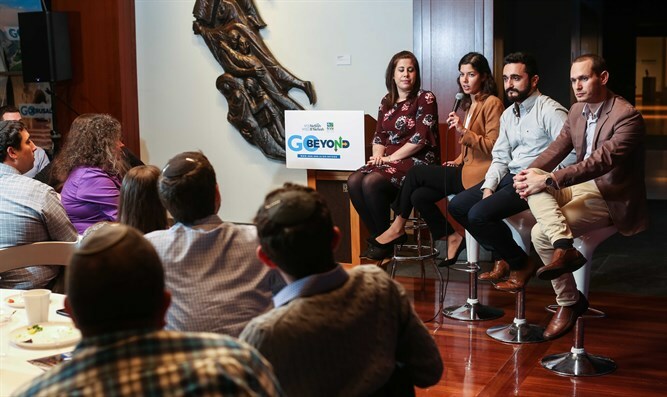 Over 75 potential Olim gathered in Lower Manhattan last night (Tuesday) at the Museum of Jewish Heritage to hear about the exciting opportunities that await them in Israel’s North, South and in Jerusalem. The event, entitled ‘Beyond the Start Up Nation,’ was hosted by Nefesh B’Nefesh and Keren Kayemeth LeIsrael (KKL), partners who have worked together for years to develop Israel’s North and South through Aliyah. New areas throughout Israel’s periphery are emerging as influential hubs on the international tech scene. Highlighting the latest developments and opportunities from these areas last night were three key players in the hi-tech communities from the North, South and Jerusalem, including Noa Yaar, Director of Strategic Partnerships for Israel Initiative 2020 (ii2020); Hanan Brand, Co-Founder of Cornerstone Venture Partners and Founder and Chairman of Made in Jerusalem; and Michael Kalantarov, Co-Founder & COO at Visual Estate, and the Community Relations Manager at Tech7 in Be’er Sheva. Since the organization’s establishment in 2002, over 15% of Nefesh B’Nefesh Olim have chosen to reside in Israel’s North and South. The noticeable growth in the number of Olim moving to the periphery is partially due to the success of Nefesh B’Nefesh’s “Go North” and “Go South” programs, which aim to energize these communities with talented and innovative Olim.